No “Artificial Horizon” or “Turn & Bank” display from any data source. It must be obvious to the casual observer via the startup screen that the prohibited functionality is not present (something more descriptive that just a version number is desired to make it easier for non-technical contest personnel to monitor). For this reason, we are delivering a special version called "COMPETITION". It is called COMPETITION because it must be used in competitions, not because it has some special functions. On the contrary, the "COMPETITION" version has no TRI info page 1.6 (the Turn Rate Indicator). 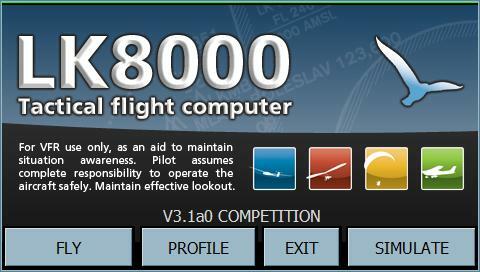 All "COMPETITION" versions of LK8000 downloaded by LK8000.IT are compliant. There are several ways to verify that the software is compliant. On startup, the splash screen is showing the version number followed by COMPETITION. After startup, either in Simulation or Fly mode, the secondary welcome page is showing COMPETITION in orange. 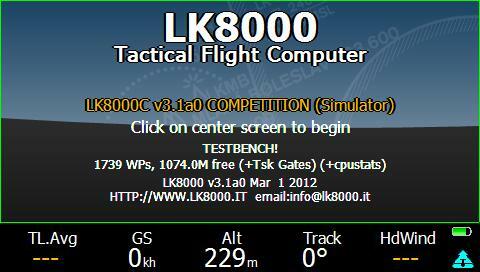 Download ONLY from LK8000.IT ! THE ONLY APPROVED AND GRANTED TO BE COMPLIANT VERSIONS FOR COMPETITIONS ARE DOWNLOADABLE FROM THE OFFICIAL RELEASE AUTHORITY OF THIS SOFTWARE, WHICH IS WWW.LK8000.IT . DOWNLOADING THE SOFTWARE FROM ANY OTHER SOURCE DOES NOT - DOES NOT - GRANT ANY KIND OF COMPLIANCY. THE CRC/MD5 CHECKSUM FOR THE EXECUTABLES MUST MATCH THOSE OF THE EXECUTABLES RELEASED BY THE SOFTWARE AUTHORITY. It is not possible to reach page 1.6 which is instead automatically skipped. If reaching page 1.6 through a customkey, the page will be blank because there is no code in the executable for it. Profiles, tasks etc. remain identical between versions. 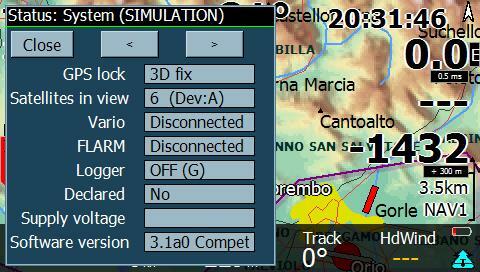 Version 4.0a COMPETITION can be downloaded in the software section.